The Eagles hosted cross town district rival Berea Pirates in double header action with the Lady Eagles and Lady Pirates playing first. Madison Southern opened the game on an 11-0 run but the Lady Pirates battled back to only trail by 7 after a quarter 13-6. Eagles doubled team freshman guard Mati Stepp and it frustrated her as she picked up her third foul of the game with 4:21 left in the half. She wouldn’t be the only player in foul trouble as 28 fouls were called in the opening half. At the half Southern led 25-14. Eagles had four players with three fouls and Berea had two with 3 fouls. Samantha Cornelison led Madison Southern with 7 points at half and Alexis Newman with 7 to lead Berea. Lady Pirates had opportunities from the free throw line but they failed to capitalize shooting 7-23. Second half began with a Newman three pointer and another Pirate basket to cut the deficit to 6 points. Eagles answers back with a 7-0 run of their own to push the lead back to 35-22. Newman with 4 three pointers in the third quarter to keep Berea within striking distance after three quarters down 9 points at 40-31. The fourth quarter Eagles score their first 11 points of the frame from the free throw line, they push the lead to as much as 16 points and win 59-44. The game was foul plagued with 54 total fouls called. Lady Eagles go 21-32 from the foul line while Berea shoots 15-34 from the line. 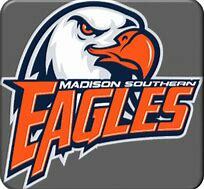 Samantha Cornelison leads the way for Madison Southern with 18 points, Aleigh Richardson with 16. Morgan Flannery adds 7 points, Sunni Walters 6, Anna King 5, Reece Estep 3, and Skylar Sparks with 3. For Berea Newman leads all scorers with 19, Maddie Godsey 8 points, Madison Howell 5, Adrienne Beggs 4, MacKenzie Howell 4, Maddy King 3, and Isis Rodgers 1. Game two began with a three pointer from Berea but Southern quickly answers with a 8-0 run. Pirates wouldn’t score again in the quarter until a pair of free throws at the 2:09 mark, even with the poor shooting and turnovers from Berea Madison Southern couldn’t take advantage and only led by 4 after the opening quarter at 12-8. Game remained close until late in the second when the Eagles go on an 13-3 run to end the half and take a 16 point lead into the locker room at 35-19. Trent Moberly with 20 points at halftime to lead the Eagles. Pirates come out of the locker room red hot scoring 7 straight points in 50 seconds to force a timeout and get within 11. Late in the third Berea pulls within 3 points at 48-45. Eagles score the final 4 points of the third including a buzzer beater by Moberly to take a 9 point lead into the final quarter at 54-45. Berea runs out of gas late and Southern holds off the rally attempt to win going away 71-57. For Madison Southern Trent Moberly ends the game with 30 points, Samuel Lee adds 13, Josh Reynolds with 8, Chad Fugate 7, Britton Robinson 6, Walt Smith 5, and Hunter Buchanan 2. Berea was led by Triston Duckworth and his 18 points, Ben West adds 15, Jaylen Dorsey 9, Zane Brown 7, Dylan Haney 3, and Nick Harrison 3. Previous articleNational Weather Service Issued A Winter Weather Advisory. Check Out Your Weather Forecast for the Weekend Here! Next articleLast night’s highlights: Tensions are high in these rivalry games between the Estill and Powell county boys and girls.